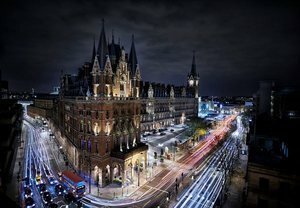 LONDON, UNITED KINGDOM--(Marketwired - May 9, 2017) - The iconic St. Pancras Renaissance Hotel London and Belvedere Vodka are proud to bring a truly unique natural experience to London and King's Cross. Now through May 26th, the hotel entrance has been transformed with a pop up Belvedere Vodka bar and flowered garden to usher in the spring season in grand style. For this month, during the exclusive Chelsea Flower Show, the entrance of the St. Pancras Renaissance Hotel London will greet guests with a celebration of the season. The trendy pop up bar and garden brings a festive, flowered atmosphere to King's Cross, inviting guests and locals to discover a new and rich sensory experience through mixology and live music. Refreshing, signature spritz cocktails offer up an elevated and tasteful alternative to traditional vodka drinks. Belvedere Vodka is passionate about showcasing a refined naturalness, expressed through cocktails that only use natural ingredients. This unique, fresh approach creates effervescent cocktails that celebrate the freshness of the spring season. Guests can enjoy the pop up bar and Belvedere Garden every week from Wednesday through Friday, from 5:00 pm to 9:00 pm. With live music, expert mixologists and an eclectic mix of locals and guests alike, the entrance to the St. Pancras is sure to create memorable nights. Combining stunning architecture, a storied history, and an expert level of service, the five-star London hotel stands at the heart of one of the city's most vibrant neighborhoods. Explore the best of King's Cross, unwind at the spa, or indulge at one of the many acclaimed dining spots. The St. Pancras puts guests at the center of everything there is to see and do in King's Cross. For more information or to book a stay at the hotel, please call +44-20-7841 3540. Housed in one of the city's most iconic buildings, the St. Pancras Renaissance Hotel London provides a five-star backdrop for stays in King's Cross. The historic hotel, originally designed by famed architect George Gilbert Scott, first opened its doors as the Midland Grand in 1873. From its striking Grand Staircase to its awe-inspiring lobby, it surrounds guests with distinctive luxury. Each hotel room and suite offers sensational amenities such as 24-hour room service, designer bedding, robes and slippers. Guests can enjoy fine dining from acclaimed chef Marcus Wareing at the Gilbert Scott Bar and Restaurant, or afternoon tea at Hansom Lounge. The hotel also features a signature spa, a fitness centre and a heated indoor pool. Planners can host a meeting or social gathering and take advantage of lavishly decorated, versatile event space onsite. The St. Pancras Renaissance Hotel London is a true icon, boasting multiple restaurants, luxury amenities and a superb location.